Only a small amount of soya is consumed directly (tofu, yoghurt). The majority of the soya (95%) is used as feed for cattle, pork, poultry and farmed fish (salmon). 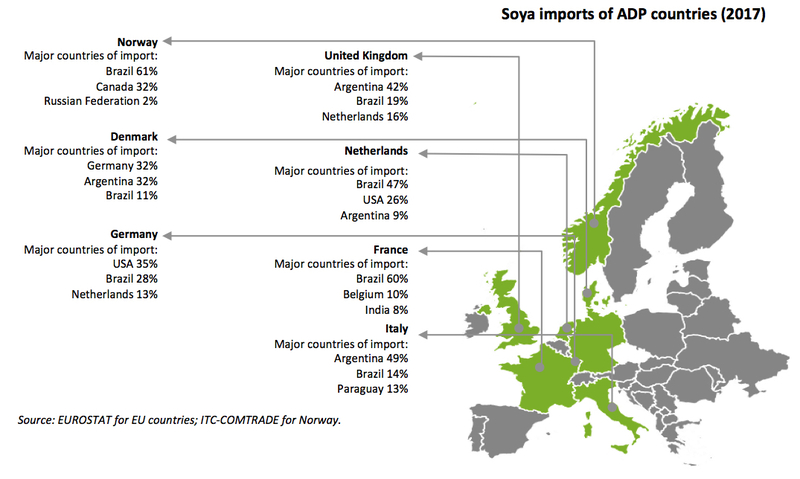 Soya is produced in many countries including (FAOSTAT): Brazil (33 million ha harvested in 2016), United States of America (33m), Argentina (19.5m), European Union (4.3m), Paraguay (3.4m), Bolivia (1.3m), Ukraine (1.8 million ha) and Uruguay (1.1). For the year 2017/2018 the global soya production is estimated at 348 million metric tons. 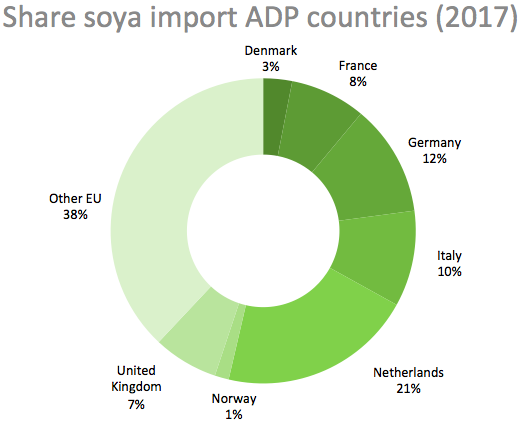 In 2017, the EU imported 33,2 million metric tons of soya of which the ADP countries imported 62%. Soya was imported from for example the USA, Brazil, Argentina, Paraguay, Canada and Ukraine. In Brazil and Argentina, soya is mainly produced in the Brazilian Cerrado and the Argentinian pampas. In addition to direct import there is also significant intra-European trade of soya beans (1201), oilcake (2304), soya bean flour and meal (120810) and soya bean oil (1507). Further information on national level initiatives in AD signatory countries: Denmark, France, Germany, Italy, Netherlands, Norway and United Kingdom. At the moment, we do not know how much of the soya imported by Europe is certified but global soya certification is still very small. In 2014, soya was harvested on 117 million ha (FAOSTAT) and only 2.4% was certified (1.9%) (Lernoud et al (2017), State of Sustainability Markets). The IDH Sustainable Trade Initiative has defined palm oil as one of their focal commodities and IDH is implementing sustainable landscape initiatives in Mato Grosso, Brazil. The State of Mato Grosso not only produces 9% of the global supply of soy but is also a major producer of beef (the #1 driver of deforestation). The AD-Partnership promotes the uptake of sustainably produced soya for example through certification by voluntary certification standard which have cut-off dates for deforestation such as RTRS (Round Table for Responsible Soy) and ProTerra. In several ADP countries national initiatives on soya have started. In the second half of 2018 we intend to organise a European Soya Meeting bringing together all the national initiatives to discuss experiences and work towards comparable commitments. In the ADP countries there are 16 companies with a 100% responsible soya commitment and 24 companies with a ‘no-deforestation’ commitment (WWF Soy Scorecard 2016). End 2017, civil society organisations launched the Cerrado Manifesto, calling for actions by companies to preserve the Brazilian woodland savannah Cerrado. 62 companies currently support the Manifesto, including European companies such as Ahold Delhaize, Marks & Spencer. Tesco and Unilever.